A look at the development of medical medicine throughout history, and how it has evolved to the high standard it is today. Medical technology and methodology have advanced exponentially throughout the years to the systems we have in place today. Medical establishments specific to the military have been around just as long, going from a chaotic, unfocused regimen of poorly trained medics to the organized, professional service stations in place now. Before the Civil War, all military medical care was uncentralized and sporadic. All forms of medical attention were given by regimental surgeons and surgeon's mates underneath them, and were extremely limited both in resources and ability. During the Civil War and for the next several decades, steady improvements in medical science, as well as communications and transport, helped to centralize the collection of casualties, and made treatment far more practical. Eventually, the U.S. Army Medical Department was solidified as a dedicated organization. By World War I, the U.S. Army Medical Department had expanded and developed a respectable infrastructure. Care was being allocated at multiple levels—first immediately on the battlefield, and then in progressively more intense levels of treatment at different sites. This allowed for greater and faster medical treatment, and the option to send combatants back into battle if the situation warranted. During World War II, expansion continued and remained flexible to adapt to the rapidly changing conditions of the war. However, there was no formal organizational plan for this expansion until after the war was over. Once the war was over, legislative acts consolidated multiple departments and gave more focus to the development of military organizations. The Air Force was formed, and given its own Medical Service so each branch of the military would have its own medicinal establishment. Despite the medical advancements that continued through the decades, the level of organization in the Vietnam War was not as developed. The limited number of human resources put a strain on the medical resources available, and the lack of professionally trained individuals made successful treatment much more difficult to administer. 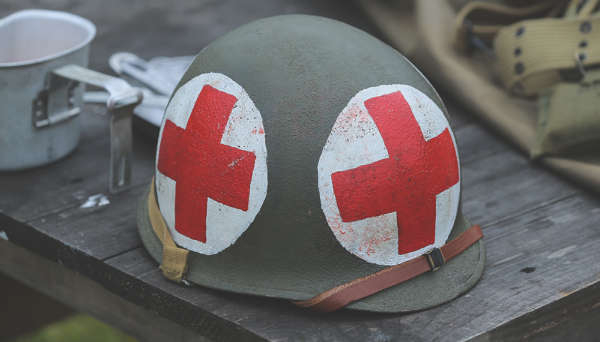 But once the war was over, more attention was devoted to strengthening the human resources available to administer military medical treatment. Modern military medical treatment centers are staffed by experienced, dedicated professionals to ensure the maximum care and treatment for any injured combatants in the field. The organization and funding are plentiful enough to ensure proper treatment, and the advancements of modern science have decreased the likelihood of death due to injury, since patients are able to receive critical care more quickly. Many recruits joining a branch of the military can opt to be trained specifically as a medic, with access to some of the greatest educational resources available. Medical treatment in the armed forces has come a long way since its random, ineffective origins. Specific military organizations began developing after the Civil War, but weren't really formalized until after the end of World War II. Medical science continues to progress, and the latest and greatest forms of treatment are now available in every branch of the military.